Iranian military cooperation with Russia in Syria is dramatically increasing Tehran’s ability to plan and conduct complex conventional operations. Iranians are learning by seeing and by doing, and are consciously trying to capture lessons-learned in Syria for use throughout their military and para-military forces. Iran is fielding a conventional force capability to complement and in some cases supplant its reliance on asymmetric means of combat. Russia is assisting Iran’s military leadership conduct this effort. It is introducing Iran and its proxies to signature Russian campaign-design concepts such as cauldron battles, multiple simultaneous and successive operations, and frontal aviation in Syria. These concepts are the fruit of almost a century of advanced Soviet and Russian thought and hard-won experience in conventional military operations. This knowledge-transfer can help the Iranian military advance its understanding of conventional war far more rapidly than it might otherwise be able to do. It can help Iran become a formidable conventional military power in the Middle East in relatively short order, permanently changing the balance of power and the security environment in the region. The Iranian military is using the Syrian conflict as a learning environment for its forces. The Islamic Revolutionary Guards Corps (IRGC)’s Imam Hossein University (IHU), which is home to the IRGC’s advanced military education programs, has deployed students to Syria almost certainly as part of an internal study and educational program for Iranian officers. Iranian officers recognize the benefits of experiencing Russian military operations. One Iranian major general, for example, praised Russia’s use of the Shahid Nojeh Air Base in Iran’s Hamedan province for exposing Iranian Air Force personnel to “[Russian] planes and the way they were operated.” Iran has also recently conducted exercises specifically to capture and practice lessons learned from Syria. Close cooperation between Russian and Iranian military personnel at the operational and tactical levels enables this knowledge transfer between the two militaries. Senior Russian and Iranian officers engaged in operational planning are in frequent contact in joint operations rooms. On the ground, at least some Russian special forces cooperate closely within Iranian-backed proxy forces, such as Lebanese Hezbollah, likely putting them in close contact with IRGC officers who also partner with, and in some cases command, those forces. Iranian troops are probably supporting targeting for Russian air strikes, although Iranian forces are likely not serving as forward air controllers for Russian aircraft. Moreover, the Russian-Iranian security axis in Syria is able to coordinate efforts across multiple fronts. Russia will surge airstrikes in northern Syria so that Iran and the Syrian regime can focus their own efforts near the capital, for example. Iran and its local proxy forces including Hezbollah and Iraqi Shia militias demonstrated their ability to use signature Russian doctrinal approaches in their successful campaign against the opposition in Aleppo City with support from Russian airstrikes and advisors. Pro-regime forces supported by Hezbollah, Afghan, and Iraqi Shi’a militia fighters led by regular IRGC Ground Forces and Quds Force operatives began launching simultaneous and successive operations against opposition-held districts in and around Aleppo City beginning as early as October 2015. Pro-regime and Iranian-backed forces continued to use simultaneous and successive operations to envelop opposition-held Aleppo City and tighten their siege throughout late 2016. Iran and pro-regime forces had not demonstrated the capability to conduct operations of this type on the Syrian battlefield prior to the Russian intervention in September 2015. Iran, Russia, and the Syrian regime recaptured Aleppo City from the opposition as the result of a three-phased campaign plan to siege and collapse opposition-held districts of the city that demonstrated Russian campaign design. Pro-regime forces supported by Russia and Iran first severed the opposition-held ground line of communication north of Aleppo City on February 3 and subsequently completed the siege by severing the final opposition-held ground line of communication northwest of Aleppo City on July 28. 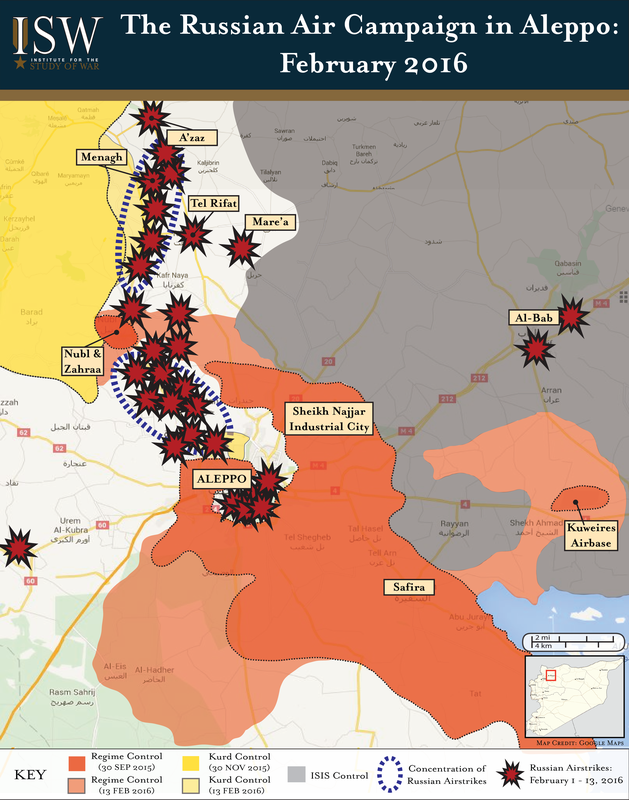 Russia, Iran, and the Syrian regime collapsed the opposition-held pocket through an aggressive air and ground campaign in Aleppo City, forcing the surrender and full withdrawal of the opposition on December 13 and 22 respectively. This type of envelopment is a signature of Russian cauldron battles seen in operations in eastern Ukraine, and was not employed at this scale in Syria prior to the Russian intervention in September 2015. Russia has also introduced Iran to frontal aviation (the use of strike aircraft assigned to ground forces to provide a mix of close air support and battlefield air interdiction operations that are hallmarks of Soviet operational art). Russia regularly conducts airstrikes against multiple opposition frontlines to fix opposition forces along multiple axes and hinder the movement of reinforcements, facilitating advances by pro-regime forces supported by Iran and Iranian proxy forces. Iranian-backed fighters are probably directly engaged in supporting Russian airstrikes by supplying intelligence to Russian forces, possibly in cooperation to Russian Special Forces active on the ground in Syria. Iranian forces enabled pro-regime forces on the ground to exploit Russian airpower over the course of the 15-month campaign to recapture Aleppo, particularly during the February operation to relieve the siege of Nubl and al Zahra north of Aleppo. Iranian forces suffered over 50 casualties during the first half of February, the majority of which likely participated in this operation. Iranian military planners have probably learned from the success of the Russian air campaign to prioritize the development of a close air support capability that would allow Iran to replicate the effects of Russian air support with proxy forces in other theaters. Iranian military planners are more than willing to use Russian airpower to enable pro-regime gains, but they would almost certainly prefer to possess such a capability themselves. The IRGC Ground Forces created a new air assault unit in late February 2016, possibly influenced by observing Russian Special Forces operations around Aleppo earlier that year. Iran has also asked Russia to sell it an entire fleet of advanced Su-30 fighter-bombers (roughly equivalent in capability with the US F-15E Strike Eagle). Such a capability would significantly reduce Tehran’s reliance on Russian (and, in Iraq, American) fixed-wing aviation to support its ground operations. The Syrian campaign has also allowed Iranian military officials to observe methods of integrating surface-to-surface and surface-to-air-missile capabilities into conventional military operations. Russia has demonstrated the utility of pairing long-range missile capabilities with air defense systems in order to showcase regional power projection and constrain U.S. freedom of maneuver in the theater. This knowledge transfer is significant considering that Iranian military officials have signaled their intention to boost the conventional applications of their formidable missile arsenal. With the Russian delivery of the advanced S-300 air defense system to Iran in October 2016, Iran can now begin to deploy its increasingly-advanced ballistic missile systems with advanced air-defense systems to create an offensive-defensive strike complex similar to what the Russians have established in Syria. The knowledge transfer between Iran and Russia presents the U.S. with a more capable Iran that remains hostile to the U.S. and its allies in the region. This transfer of Russian capabilities represents the latest high-water mark in Iran’s effort to increase its own conventional military capabilities. Iranian conventional military capabilities will continue to increase rapidly as long as Russian and Iranian forces continue to operate alongside each other in Syria simply by learning the best practices for developing, deploying, and using such forces in combat. Russia is poised to teach Iran additional methods of warfare as it prepares for the next phase of the pro-regime campaign in Syria. The expansion of Iranian maneuver and combined force capabilities will not be limited to Syria, however. Iran will likely export these capabilities to other theaters such as Iraq. The U.S. and its regional partners must recognize that the deep Russo-Iranian military cooperation in Syria is in itself a major threat to the balance of power within the Middle East. This report was produced with the Critical Threats Project. The insights are part of an intensive multi-month exercise to frame, design, and evaluate potential courses of action that the United States could pursue to defeat the threat from the Islamic State in Iraq and al Sham (ISIS) and al Qaeda in Syria. Related reports in the series are available here.